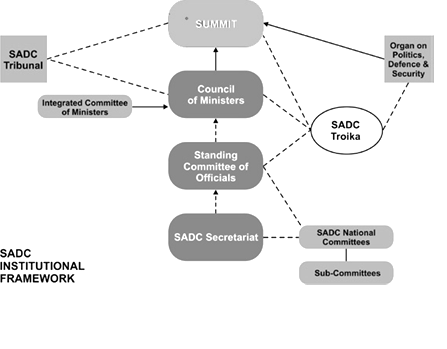 The Southern African Development Community (SADC) is a transnational or-ganization that has 15 member states and total population of about 280 million people. One of the aims of SADC, as founded in Article 5 of its Treaty, is to strive towards regional integration. SADC has adopted certain basic norms and standards in its Treaty, Charter on Fundamental Social Rights, and various protocols that are applicable to all citizens within SADC. In this paper the concept of a Transnational Legal Process (TLP) and regional labor standards are reviewed. Attention is given to the establishment and original aims of SADC. The SADC Charter is analyzed and the institutional architecture of SADC is discussed. The link between the ILO core conventions and the SADC Charter is also shown. The author argues that regional integration and a Transnational Labor Relations system within SADC is possible and that the SADC Charter and the ILO core conventions can be used as the basis of regional labor standards within SADC which in turn will lead to the achievement of social justice. The author also evaluates the link between regional integration as a SADC strategy and globalization and argues that regional integration is not necessarily regional globalization.